December 14, 2014 HTML Editors, Software, Web AuthoringWeb Page Maker Software Inc. Web Page Maker is an easy-to-use web page design tool that allows you to create and upload a professional web page in minutes without having to know HTML. Simply add text, images, photos, animation, navigation bar, flash, buttons, logos, and more onto web page and move them freely. 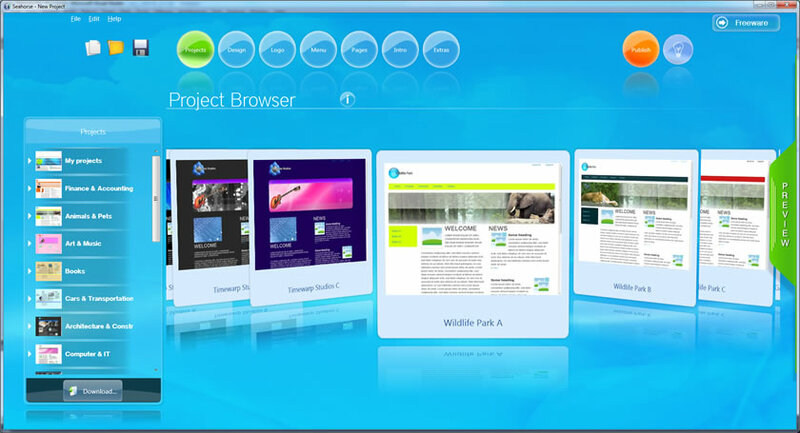 It offers several pre-designed templates, so you can create a new web page from them. You can export your page to HTML, and then upload your web pages to the Internet automatically by clicking a publish button. – Super easy — no HTML or programming needed. – Drag and drop text, images, animations, flash, sound any where on web page and move them freely. – The ability to create Rectangles, roundrects, Ellipses. – 8 pre-designed templates are offered. – Several ready-to-use Java Script effects are offered. – Resize or move objects with pixel accuracy. – Unlimited undo and redo capabilities that allow you to go back any point in the design process. – Preview web page in browser with one-click. – Publish your web site with just one-click. Seahorse is new, and different from other Web Authoring Software. You have the unique ability to choose between templates and apply any colors to the background, foreground, text and links and even add Clip-Arts and images in to the layout. You are not bound to predefined template colors or image themes. The new release comes with powerful features such as I-Phone Websites, PayPal Button Wizard, W3C Conform HTML Code, Download Branch-Templates and many more. No HTML knowledge is required. Seahorse 6 has a WYSIWYG (What you see is what you get) editor where you can create thumbnails of your pictures in one click, add links, MP3-Music files, SWF files and even Mpeg Video-Clips to your site. If necessary, you can view and edit the HTML code at any time. Seahorse gives you the comfort to publish your website to the Internet directly from the program without additional FTP software. Build Websites without HTML knowledge! Automatically build stunning profit pulling web pages in an Instant. Stop creating your web pages the hard way! No HTML coding! Just click ‘Generate Code’ and Instant Site Maker creates your sales page, thank you page and even automatically creates your ClickBank instant download link. Quickly create your product download link – so customers get their products automatically as soon as their order is processed. Quickly and easily create web pages that are fully optimised for high search engine ranking because Instant Site Maker is designed to automatically include search engine friendly HTML code (meta tags) for your pages. Instant Site Maker does all this and more.. When you order today, youll also receive the resell rights, along with the web page and graphics so you can sell Instant Site Maker on your own site. Make just one sale, and you’ve paid for your investment!